Want to test your knowledge of oral pathology? 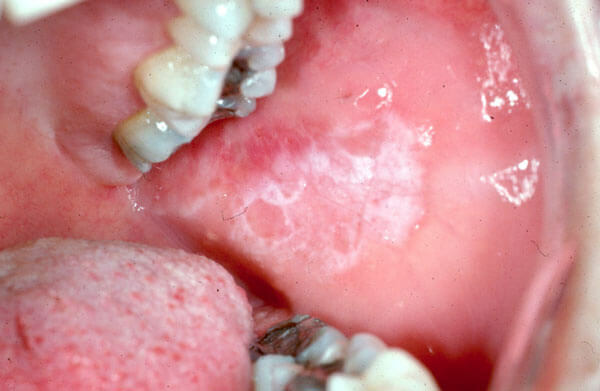 Can you identify a cancerous lesion from an infectious lesion or inflammatory lesion. Take our home oral pathology self test for fun and information. Threes are wild! Three of the following pictures are painful conditions. Three of the following pictures are tumors. One of these tumors is cancerous. Take a guess and identify the cancerous tumor. Present for only 2 days, this painful deep ulcer can be misdiagnosed as cancerous without a full clinical history and diagnosis from the oral surgeon. Fortunately, biopsy and debridement will actually speed up the healing process and decrease the amount of pain the patient is experiencing. This is not cancer. It is actually a painful infection from an abscessed first molar. This situation is best treated by incision and drainage of the abscess with extraction or root canal therapy of the abscessed tooth. This lesion is actually a noncancerous outgrowth of normal bone called a palatal torus. Occasionally, these bony outgrowths get traumatized and develop painful ulcerations. Removal of the bony torus cures this situation. This painless mass is actually a cancerous growth of the salivary glands found in the roof of the mouth. These can typically be removed by wide local excision, however final treatment will depend on microscopic tissue examination of the specimen. This painless mass is actually a mole. While moles are not commonly found in the mouth. 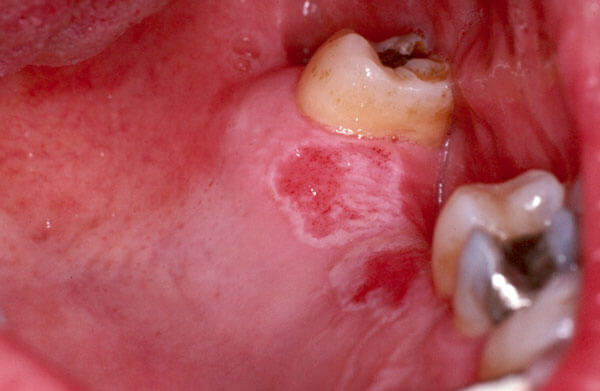 pigmented lesions in the mouth should be removed for biopsy as it is believed they are at an increased risk of becoming cancerous. 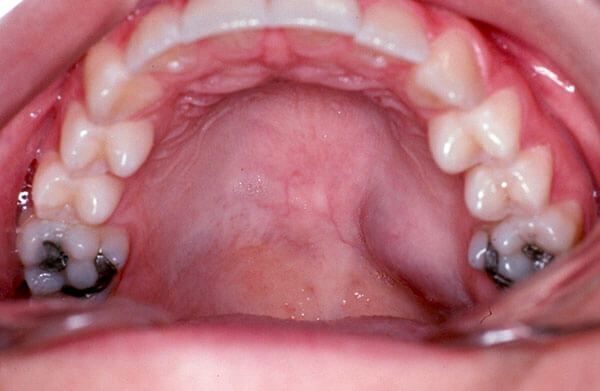 This painless mass is actually a benign tumor of the salivary glands found in the roof of the mouth. These tumors can be locally destructive and over time have the potential to become cancerous as well. Wide local excision is the preferred treatment. THINGS THAT YOUR MOTHER NEVER TAUGHT YOU! One of these three pictures is oral cancer. Can you identify the cancerous lesion? While this white cauliflower-like lesion may appear cancerous and dangerous, it is actually quite benign. This lesion is actually a wart which is caused by a virus and is easily removed in the office. This red nodular mass is usually painless and quite benign. Frequently caused by some minor irritation combined with hormonal changes during pregnancy and puberty, it is easily removed in the office. This red painless tissue is a cancerous growth that was found in a non drinking and smoking patient after a cleaning and deep scaling. Suspicious tissue changes that lack explanation or response to treatment should be biopsied. Here are some common tissue changes which we see all too frequently. These are what I call “smokers’ patches”. Depending on how a cigarette is habitually smoked, the spot where the smoke first strikes is most likely to produce either white or white/red changes. These “smokers’ patches” if caught early enough in their precancerous phase can be easily and quickly removed in the office. 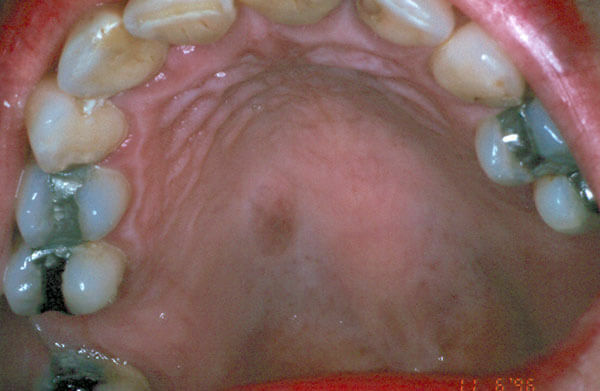 “Smokers’ patches” occur most frequently on the soft palate, floor of the mouth, tongue, and cheeks. Unfortunately, these two individuals have invasive cancer (cancer which is now invading beneath the skin surface). Their treatment now requires more extensive and expensive therapy which will require surgery in a hospital location as well as radiation and chemotherapy. Catching cancer before it becomes invasive is one of our treatment goals. Please let us examine any unexplained tissue changes. Okay, so you don’t light up. Tobacco in the form of snuff can cause its own long term health problems. 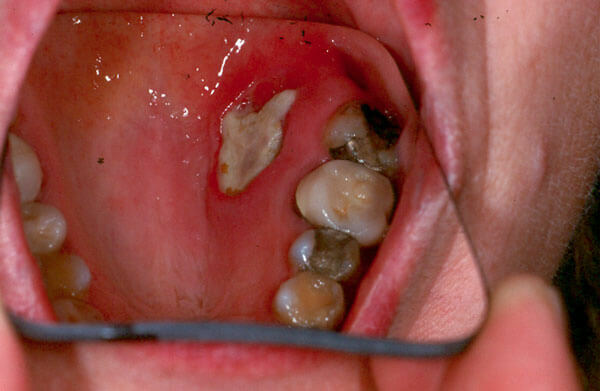 In this patient the moderate long term use of snuff has caused severe gum recession, staining of his teeth, and most importantly a precancerous white change in his lip and gum tissue. 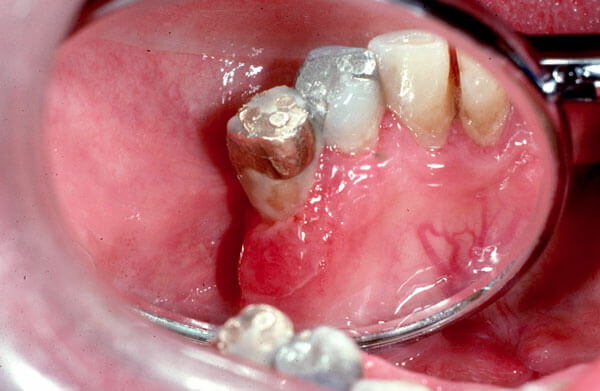 Continued use of snuff will lead not only to the loss of his front teeth but also to the eventual development of invasive cancer. Three of the following pictures demonstrate acute yeast infections. The other three pictures are look alike conditions which can be mistaken for yeast infections. Which mouth can you safely kiss? A. Yes, you can safely kiss this mouth. While this tongue may look unusual, this condition is well recognized as Benign Migratory Glossitis (also known as Geographic Tongue). It is a harmless condition which requires no treatment other than the identification. B. Definitely not! 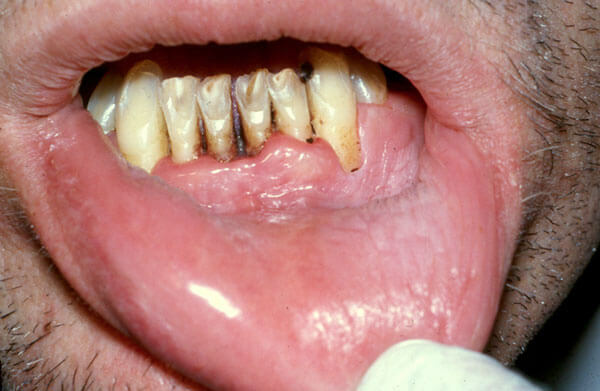 This patient has the oral findings of the secondary stage of syphilis. 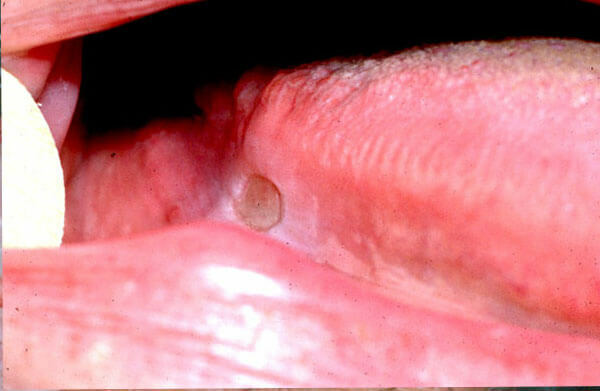 This stage of syphilis is highly contagious upon contact with the moist skin of the mouth. If diagnosed and treated early during the first or second stage, syphilis is easily cured. C. Probably not! While the yeast infection is quite harmless it is, an opportunistic invader. This patient’s immune system has been weakened by a viral infection. You shouldn’t kiss someone with a cold! D. Probably not! While this chronic yeast infection which causes this condition, angular cheilitis, poses no threat to a healthy individual, kissing someone with open sores is something your mother would tell you not to do. Finally, this patient might not want to kiss you, as puckering up is hard to do when your lips are this sore! This condition can be effectively treated with antifungal cream. E. Probably not! For the same reason as discussed in example C.
F. Definitely not! This patient was misdiagnosed by three different M.D.s as having yeast infection. Syphilis has been called the “great mimic” as its appearance can look like so many other conditions even to the trained eye. If it is hard enough for trained professional it is impossible for the untrained person to make a diagnosis. Oral medicine is best left to specialists who treat the mouth on a daily basis. MAY ALL YOUR CHRISTMAS’ BE WHITE! A 34 year old female who is pregnant. She does not drink, but she does admit to smoking one pack of cigarettes per day for the last 15 years. On routine examination there are painless small white patches on the left and right sides of her tongue. A 63 year old male with a history of hypertension treated with high blood pressure medication, comes in with a complaint of burning of the right and left cheeks. A 53 year old male who admits to social drinking as well as smoking one and a half packs of cigarettes a day, comes in on referral by his general dentist for the evaluation of a painless white area on the underside of his tongue. 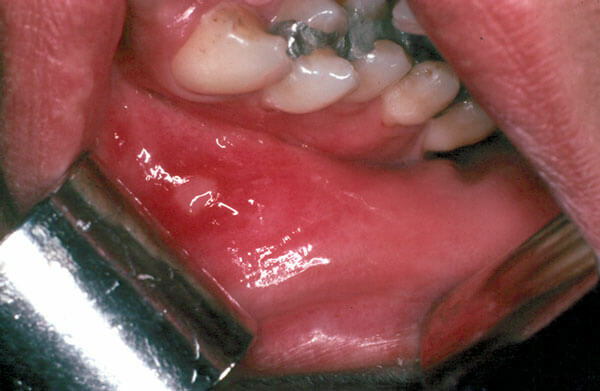 A 16 year old female is referred to your office to evaluate burning in the mouth which is very uncomfortable. A white rash is very prominent on both right and left cheeks, but to a much greater degree on the left cheek. This 42 year old male is a successful highly stressed realtor. He comes to your office complaining of soreness and burning of the right and left cheeks which on examination show a white rough textured rash extending from the second molar region to the corners of the mouth. He admits to smoking a pack of cigarettes a day and enjoying wine with his evening meals. a. A chemical burn from aspirin used by the patient to minimize the pain of the toothache. c. An invasive cancerous lesion. 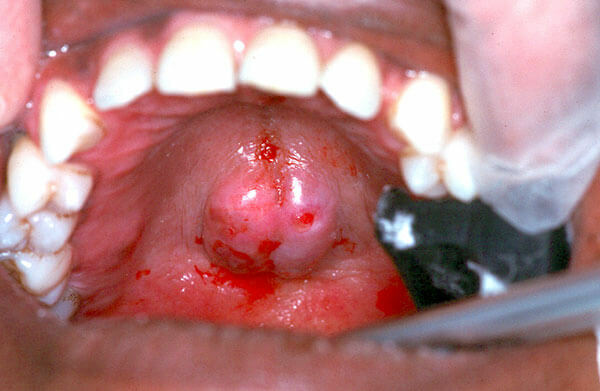 d. Oral tissue changes seen with a patient who has an HIV infection. e. Oral tissue changes seen with a patient that has developed an allergy to a flavoring used in a toothpaste. 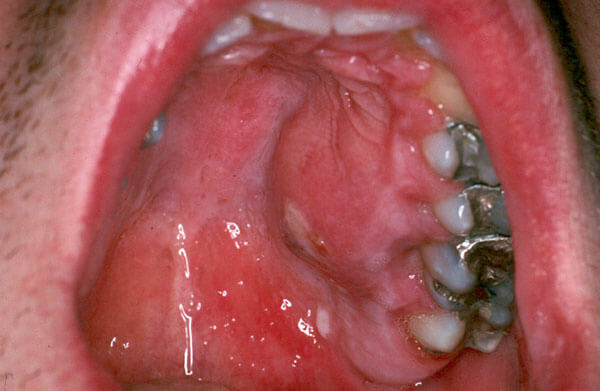 f. Oral tissue changes seen with lichen planus, an autoimmune condition. 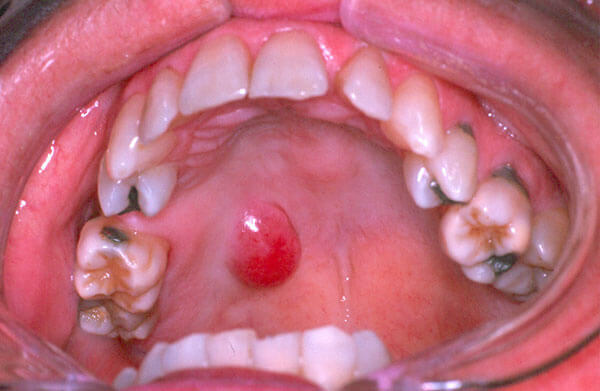 g. Oral lesion of the secondary stage of syphilis. i. Whites oral tissue changes caused by chronic repetitive trauma (i.e. Such as a habit of sucking or chewing on ones lip or cheek). 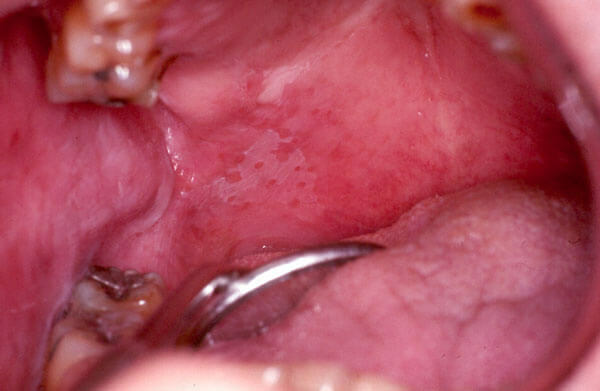 d. This oral tissue change seen here is called White Hairy Leukoplakia and is associated with HIV infections. Subsequent serologic testing confirmed this diagnosis. f , Lichen Planus which is a rash which can be seen both in the mouth and/or on the skin. This rash can cause burning in the mouth and itching of the skin. Treatment depends on symptoms and severity of the rash. b. This is indeed a precancerous change. This patient will require the surface stripping of this white change as well as close follow-up to make sure this tissue change does not recur at location or adjacent sites. 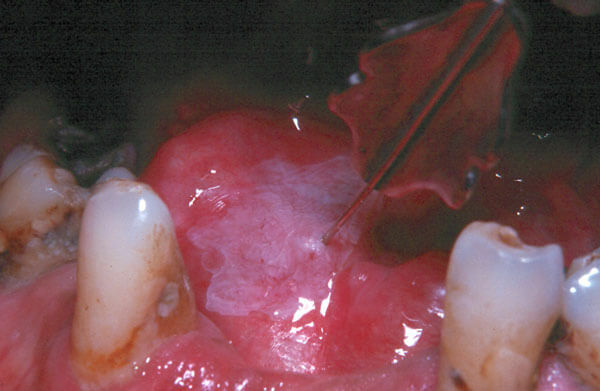 e. This tissue change is consistent with a topical allergy to patient’s toothpaste. Once the allergen was identified and eliminated the rash and burning of the cheeks disappeared. c. This is invasive cancer. More extensive surgery and radiation will be required to treat this lesion. i. This white change is caused by the friction which occurs during the habitual rubbing of the lip and cheeks against the teeth. Other than identification no additional treatment is required. Literally they do! All sorts of ulcers: superficial ulcers, deep ulcers, cancerous ulcers, inflammatory ulcers, traumatic ulcers, autoimmune ulcers and finally ulcers due to infection. Which of the following ulcers would you worry about? 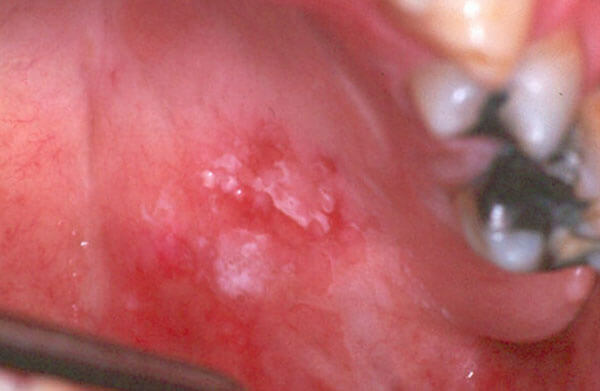 Which of the following ulcers are cancerous? 1. Of the two ulcers pictured here, most people would say photo 1B is the most worrisome. Unfortunately they are wrong. 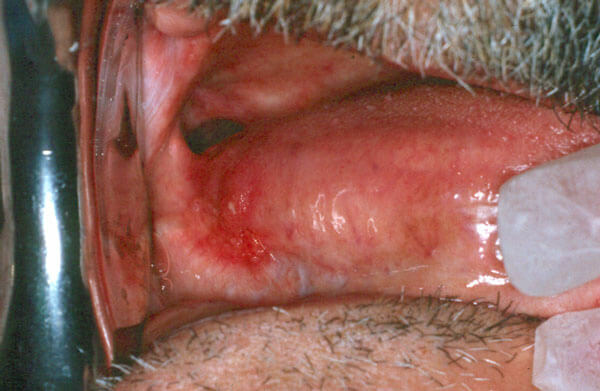 The red small ulcer on the lateral posterior tongue in 1A is invasive cancer. The larger more uniform ulcer seen in photo B. is the result of chronic trauma. 2. This should be an easy one! Photo 2A looks angry and ugly. This is a large invasive cancer which will require extensive treatment. This patient believed this lesion to be caused by frequent pizza burns. Only when it became painful did he seek treatment. In its early stages cancer is rarely painful. Photo 2B is actually an ulcer caused by primary syphilis. While worrisome in the appearance, syphilis is readily cured by proper diagnosis and antibiotic therapy. Please be careful eating Pizza! 3. While these two ulcers look serious, only photo 3A is worrisome as it is caused by an autoimmune condition called Pemphigus. Photo 3B actually is the result of a bad pizza burn. 4. Both of the above pictures of ulcers are not serious causes for concern even though both are usually painful initially. 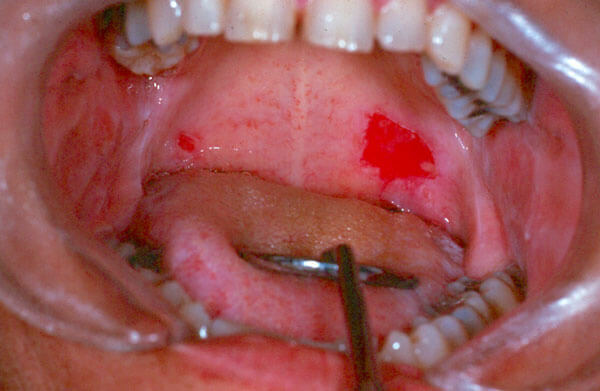 Photo 4A is the result of a recurrent herpetic viral infection (which is similar to a cold sore). 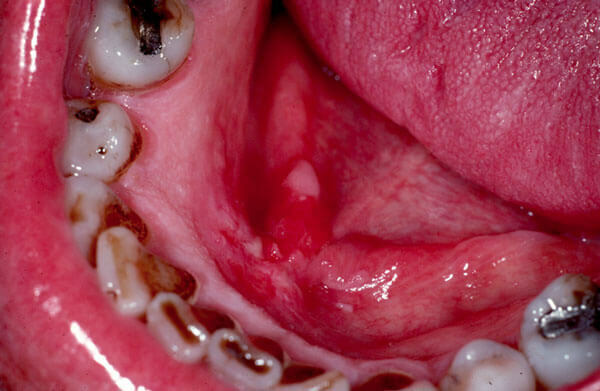 Photo 4B is a typical apthous ulcer (canker sore). Both of these lesions will be healed within ten days without treatment.